Half of all countries in the world have eliminated malaria, mostly since the Second World War. 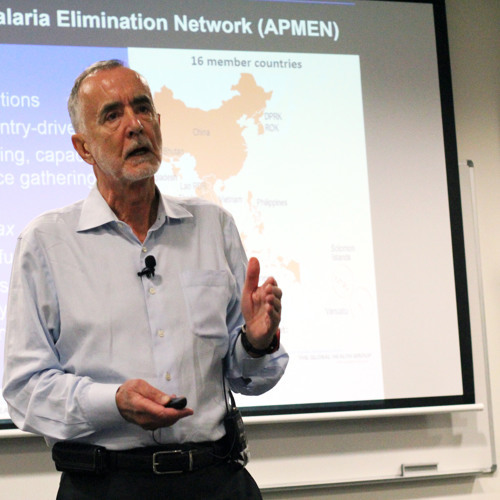 Ambitious strategies are now being put in place to eradicate human malaria worldwide by 2050 and to eliminate malaria in the Asia Pacific region by 2030. The Asia Pacific goal has recently been discussed at the East Asia Summit in Myanmar. Sir Richard presented the historical progress with malaria elimination and the prospects and requirements for global eradication by 2050. He focused on recent dramatic progress in Asia Pacific and the Asia Pacific goal of malaria freedom by 2030. Sir Richard drew attention to the successful elimination (re-elimination) in Sri Lanka, and the striking progress in countries such as China, Indonesia, and the Philippines. Outstanding challenges, such as artemisinin resistance in the Mekong Region and malaria caused by Plasmodium knowlesi, was discussed. The political and financial requirements for malaria elimination in Asia Pacific was also elaborated. Sir Richard Feachem is Director of the Global Health Group at UCSF Global Health Sciences, Professor of Global Health at both the University of California, San Francisco and the University of California, Berkeley, and former Executive Director of Global Health Sciences. He is also a Visiting Professor at London University and an Honorary Professor at the University of Queensland.